Port of Baltimore’s top roll on/roll off customer, Norway-based Wallenius Wilhelmsen Logistics (WWL), has entered into a new 30-year contract with the Maryland Port Administration. The new partnership guarantees that WWL will continue serving Baltimore through 2045. The Port of Oakland is raising the height of four ship-to-shore container cranes by 26 feet to enable them to serve ultra large container ships. The $13.95 million project is scheduled to begin in April. The Port of Kalama board of commissioners has awarded a contract for the construction of thousands of feet of new warehouse space to accommodate the expansion of port tenants Steelscape and NW Innovation Works. A shrinking supply of trade-enabling industrial land is the greatest threat confronting the Vancouver trade gateway and the region’s continued livability, according to Port Metro Vancouver CEO Robin Silvester. The board of directors of the Nanaimo Port Authority (NPA) has asked management to start developing a Request for Proposals (RFP) for a daily foot passenger ferry service between Nanaimo and Vancouver (BC) and to issue the RFP in January 2016. The Port of Kalama has been awarded a $50,000 economic feasibility grant by the Washington State Community Economic Revitalization Board to help identify how to best maximize the economic and community benefits at the port’s new Spencer Creek Business Park. Pete Grossgart is the new marketing manager at the Port of Stockton. The Hamilton Port Authority was recently recognized by the Share the Road Coalition as a Bicycle Friendly Business. The Port of Hueneme has signed on as a participant in Green Marine, a voluntary environmental program for the maritime industry in North America. The Port of Virginia’s chassis pool on January 1 will implement a direct-to-BCO (beneficial cargo owner) billing system that is aimed at streamlining and simplifying the billing process for paying chassis usage fees. The new Upriver Container Barge-Rail Shuttle will help importers and exporters in eastern Washington, Oregon and Idaho move containerized agricultural products to markets in Asia. An informal partnership including Northwest Container Service, Tidewater Barge and the ports of Morrow, Lewiston and Portland helped facilitate the return of this service. The ongoing development of the Bellingham Waterfront District, expansion of marine trades through investments in shoreline infrastructure and planning for future projects and re-development of the Bellingham Shipping Terminal and Log Pond Area are among the "corporate goals" set forth in the Port of Bellingham's newly adopted 2016 Strategic Budget. The securities rating agencies Fitch Ratings and Standard & Poor’s have each affirmed the 'A ' rating and "stable" outlook of the $351 million in outstanding harbor system revenue bonds issued for the Harbors Division of the Hawaii Department of Transportation. 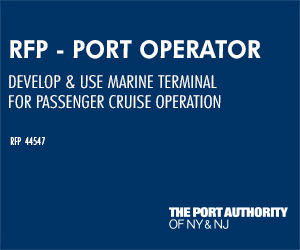 The Port Authority of New York & New Jersey’s proposed 2015 Capital Budget provides $3.5 billion to maintain transportation facilities at the region's seaports, airports, tunnels, bridges, terminals and PATH commuter rail system and continued redevelopment of the World Trade Center site. Capital investments to support the dramatic growth of the Seattle’s cruise business and Seattle-Tacoma International Airport are included in the 2016 budget approved by the Port of Seattle Commission on November 24. The Port of Vancouver USA’s 2016 budget allocates $11.3 million for 5 terminal and building investments, while holding the port levy steady for the fourth year in a row.